As a summer research program within the mechanical engineering department prepares to enter its 10th year, program alums have reflected on their experience and how it helped them get to where they are now. The MoSAIc (Multiscale Sensing Actuation and Imaging) REU (Research Experience for Undergraduates) program was launched at Iowa State in 2010. The MoSAIc program – which is hosted by Iowa State’s Department of Mechanical Engineering (ME) – serves as one site within the National Science Foundation’s national REU program. MoSAIc is one of eight REU sites on campus and one of four within Iowa State’s College of Engineering. MoSAIc is a 10-week summer program that provides novel research experiences for undergraduate students in the areas of design and manufacturing of micro/nanoscale sensors, actuators, and smart materials, as well as advanced imaging and diagnostic systems. The students work alongside faculty advisers and at the end of the summer present their findings during a poster symposium which includes students from all REU programs on campus. Each cohort consists of roughly 10 students and the program aims to prepare these students for post-undergraduate education and careers in research. Rebekah De Penning was part of the 2015 cohort and she worked alongside ME Assistant Professor Sonal Padalkar. De Penning said her experience in the MoSAIc program influenced her to pursue her Ph.D. in ME from Iowa State. This past summer De Penning served as the graduate mentor for the MoSAIc cohort. Her responsibilities included planning group activities, giving tours of campus and answering any questions the students had throughout the summer. De Penning, far right, poses with members of the 2018 MoSAIc REU cohort. Now as a graduate student, De Penning has continued her work in the lab of Dr. Padalkar, who also serves as her adviser. “When I was applying to grad schools, I asked her if she had room for another grad student in her lab, and she agreed to take me on. Because of the program she was already familiar with me and my work,” De Penning said. De Penning added that the skills she gained through her MoSAIc experience, continue to be applicable to the research she does today. “I am working on different projects now, but the same research principles apply. To work in any laboratory, you need to know about safety, to patiently wait for your experiments to finish, and to be careful when setting them up. I knew some of these things from undergraduate labs, but the MoSAIc program made me really take ownership of what I was doing, so those practices really sank in,” she said. Nadab Wubshet was also part of the 2015 MoSAIc REU cohort. At the time he was a sophomore studying ME at Washington University in St. Louis. While with MoSAIc, Wubshet was advised by ME Professor Baskar Ganapathysubramanian and his summer research focused on modelling of microfluidic flow sculpting. Wubshet worked alongside then-Ph.D. student Daniel Stoecklein, who is currently a postdoc in the Di Carlo Laboratory at UCLA. 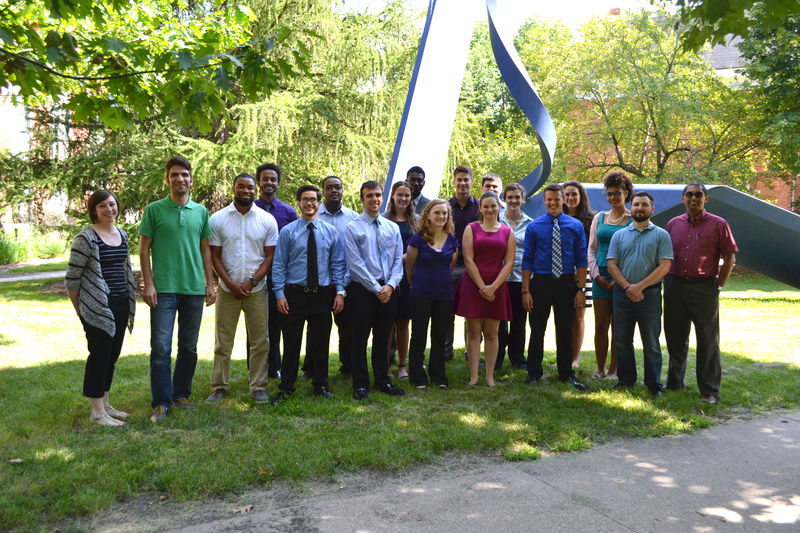 Wubshet, fourth from the left, poses with other members of the 2015 MoSAIc REU cohort. De Penning is also pictured sixth from the left. Wubshet is currently pursuing a Ph.D. in mechanical engineering from the University of Michigan where he works in Allen Liu’s Laboratory of Cellular and Molecular Systems. His research focuses on building artificial cells. Similar to De Penning, Wubshet said his experience in the MoSAIc program was influential on his academic development. “The MoSAIc experience opened multiple doors for me. First, it gave me the opportunity to have a research experience regardless of my nominal prior research experience as just a sophomore. Moreover, it was an experience that encouraged me and gave me an incentive to pursue graduate school,” he said. Both Wubshet and De Penning encourage younger students to seriously consider the MoSIAc REU program, even if those students don’t know what exactly they want to do for research or what they want to do after graduation. “Even if you’re not sure you’d want to go to grad school, it doesn’t hurt to try it. Think of it like an internship. You might discover that you really like grad school, and you might not. Isn’t it better to figure that out during a summer internship than after you graduate?” De Penning said.